I recently bought a Melissa Odabash swimsuit from the Outnet (half price) and then was lucky enough to stumble upon the Melissa Odabash sample sale in town the other day. And I can tell you that the quality is really, really good. They fit really well, they don’t cut in or gape and they last years if you look after them. always rinse your swimwear in cold water and don’t dry in direct sunlight. be careful in spas or heated pools as the chemicals are strong and can shorten the life of your swimsuit. I try to wear high street swimwear so that it doesn’t matter too much. I tend to avoid buying white swimwear. As beautiful as it is when you have a tan, it really doesn’t last. The Outnet is the best place to find Melissa Odabash swimwear, because it’s usually half price and without the discount it can feel a bit expensive given how many weeks of the year we actually get to wear them! See the full range on the Outnet here. I bought this from the sample sale (it was £60 at the sample sale, so this is still a good price) and it is beautiful on. I sized up I have found Melissa Odabash to come up a bit small so I sized up, even though it says true to size here. 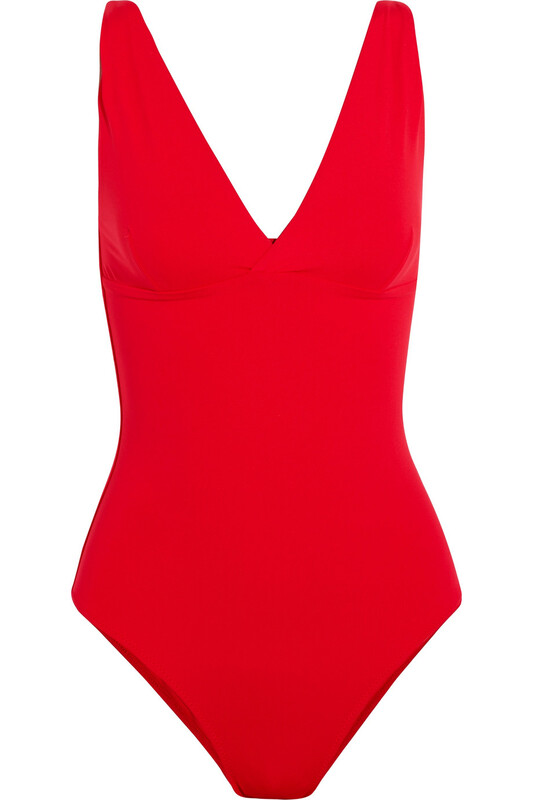 And if these seem just a bit too much to spend on swimwear, then I can highly recommend this one from &Otherstories. I made my friend try mine on yesterday and she bought it immediately. Size up. Happy Swimwear shopping! And remember. DO NOT try swimwear on in changing rooms. You will end up putting everything back. Instead, take them home and try them on in the comfort of your home, in the right frame of mind!